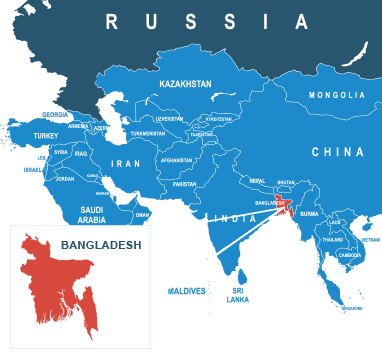 One of the world’s most densely populated countries, it’s no surprise that we regularly arrange parcel delivery to Bangladesh. With our extensive experience in international parcel delivery, you can be certain that arranging your shipping to Bangladesh with DPD Local Online will ensure that you’re getting the very best service for the most affordable price. When it comes to parcel delivery to Bangladesh, we’re proud to offer some of the best options for quick, easy and safe courier delivery whether you’re sending lots of parcels or just one. Working out how much shipping to Bangladesh will cost you is easy with DPD Local Online too. Just choose from our express and economy courier delivery to find the most appropriate service for your budget, all you need to do is complete our simple online form and we’ll give you an instant quote. Trusted by millions of senders, shipping to Bangladesh needn’t be daunting with DPD Local Online. To put your parcel in safe hands, book your parcel delivery service to Bangladesh today. Do I need to deal with customs when sending from the UK to Bangladesh? There are various customs duties that your parcel will undergo when send to Bangladesh from the UK, with the majority of goods subject to import tax and other regulations. At DPDLocal-Online, however, we make shipping to Bangladesh really straightforward. Whenever you book an international order with us, we’ll actually send you all the documents you need to complete with your label. How much does it cost to send a parcel from the UK to Bangladesh? Posting to Bangladesh can cost as low as £27.30 by booking through DPDLocal-Online. By negotiating with our couriers, we’re able to find the most efficient methods of getting your parcels to their destination, and we’ll always pass on the savings to you. How should I address my parcel for delivery to Bangladesh? There are a couple of parts of the Bangladeshi addressing system that might cause some people to trip at the addressing process. For example, addresses are aligned to the right of the label, and there is normally a dash required between the locality and the postcode. Not to worry, though: the Universal Postal Union has put together a useful addressing guide for Bangladesh to ensure that anyone can address their parcels there correctly. You can find a more detailed list online here. For any further information, contact HM Revenue and Customs, or visit our prohibited items page for a list of goods not fit for courier handling in the UK.